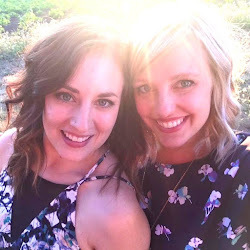 It has been WAY too long since Katie and I blogged, or more importantly, experienced a good happy hour! For some reason second semester senior year is proving busy and I am not okay with it! Tonight, after Katie choreographed a terrific dance and I spent the day painting my grandparents house, we headed down to NW 23rd and Hoyt for happy hour at 23 Hoyt. When we walked in the front door, we had our choice of seating anywhere to the left. The restaurant is fairly large but this is the only place their happy hour seating is, so once that section of the restaurant filled up, some parties were forced to wait. Kind of a strange set up, but the atmosphere was unique. Tall ceilings, candlelight tables, trees in the room, bench seats, upstairs tables. Initially we felt under-dressed, me in my zip-up and Katie in her sneakers, but as the night went on, some people were more dressed up and others more casual so we decided our outfits were acceptable. Their happy hour menu had $1 to $5 food specials and some $5 drink specials. We both ordered Pomegranate Cosmos, the only vodka drink, but the tequila, cranberry, lime drink was tempting as well. 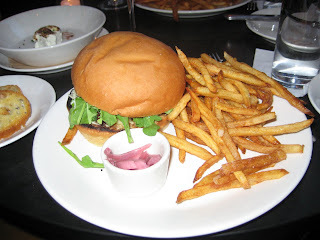 As we pondered the menu, we thought about getting the burger and Pomme Frites since they were two of the only things we really knew on the menu, but we decided to ask the waiter for his suggestions. He suggested the fries and the burger so that basically decided it. 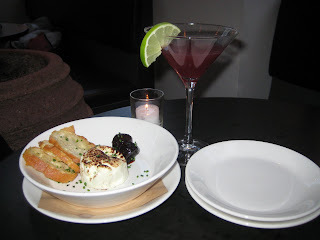 We ended up ordering goat cheese with port soaked prunes ($3), and cheeseburgers ($5). We were excited to learn that the burgers included fries because usually the fries are separate on the happy hour menu. Good deal! The food, the drinks, and the atmosphere were all great. But perhaps the best part of happy hour at 23 Hoyt was the woman who sat next to us. White hair, British accent, pearls, sassy as all get out...our kind of lady. This was especially confirmed when upon receiving a small number of bread with her goat cheese (as did we) she exclaimed "well, we'll certainly be needing more toasties." Exactly. She also mentioned to her somewhat plump dining partner "well, of course you're getting the hamburger." Mean. But again, correct. We would definitely recommend this happy hour if you're looking for something with a great location on NW 23rd.